Local Taxation, an emerging fact of life in the burgeoning towns. `night soil` into the very areas to be cleansed. “[October 1655. Thair was ane new cess imposit upone the inhabitantes of Edinburgh, for bying of hors and kairtes, for careying away and transporting of the filth. muk. and fuilzie out of the clossis and calsev of Edinburgh. quhich much greived the pepill ; and so much the moir. 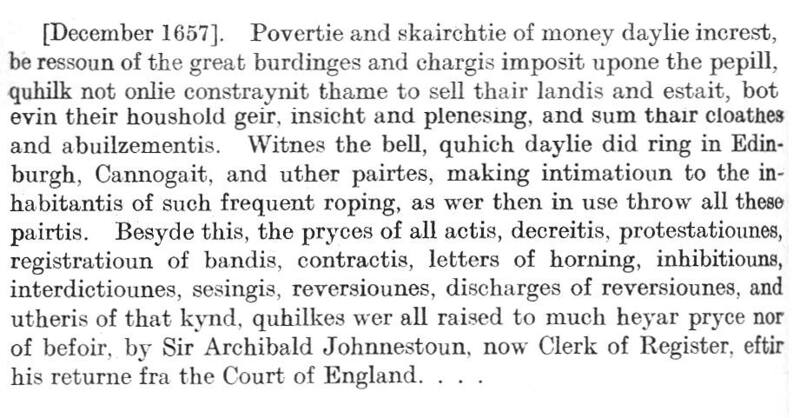 becaus the pepill resavit no satisfactioun for thair money, bot the calsey and clossis continued moir and moir flithie, and no paynes takin for cleynging the streitis. But poverty and the general shortage of money seems to have continued in 1657 as Nicoll again records . His note this time refers to the roping [rouping or auction, commonly forced sale of goods and property to satisfy a debt] being frequent. third party, resulting in some very complicated arrangements. The fact of years of hardship, increasing taxation and poverty, heightened by feast and famine of variable harvests from year to year, no doubt contributed to the general feeling of a desire for change. This would have overflowed into the general acceptance of a restoration of a Scottish Parliament and a King (Charles II) in the hope that it would improve their lot. called, and ultimately the intense grovelling to please the Catholic King James II. The inevitable loser was the common people. persecutors were sent as slaves to the same destinations.